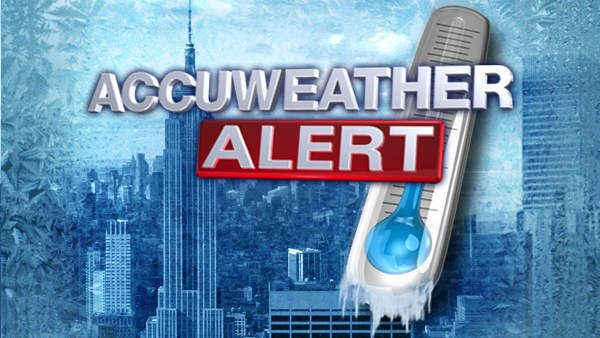 NEW YORK (WABC) -- Guess what? It's cold again. An arctic chill has once again plunged the New York area into a bitter deep freeze, with potentially record-setting temperatures expected through the weekend. People are warned to limit outdoor exposure whenever possible and to check on neighbors, particularly the elderly. Experts warn that hypothermia can develop quickly if you are not careful. "The interesting thing about hypothermia is that you can develop hypothermia at any temperature," said Dr. Deb Lonzer, of the Cleveland Clinic. "So it doesn't have to be 10 below zero, it just has to be below your body temperature." Some of us are much more vulnerable than others. "Kids, especially little kids, can lose a third of their body heat through their heads when they're outside," Dr. Lonzer said. "So they have to be really well wrapped up." Fingers that tingle is a tell-tale sign of frostnip, White Plains Hospital emergency director Dr. Rafael Torres said. Frostbite is the next and more serious stage. "It causes cell damage," Dr. Torres said. "It causes crystals inside the cells, which then break and cause damage to different layers of your body." Hypothermia kicks in when the body losses heat, and signs to look for include shivering and clumsiness. "Maybe you're not handling your equipment very well," Dr. Torres said. "Trouble speaking, slurring your words, some confusion. Maybe your partner is saying, 'Hey, I don't know what you are talking about." Additionally, anyone who works outside or will be outside for extended periods of time is urged to bundle up. --Report any loss of heat or hot water to property managers immediately, and call 311 or your local authorities. --If your home lacks heat, get to a warm place tonight if you can and wear extra layers of dry, loose-fitting clothing, hats and gloves to help stay warm. --Never use a gas stove to heat your home. --Never use a kerosene or propane space heater, charcoal or gas grill, or generator indoors or near the home. --If a carbon monoxide detector goes off in your home, call 911, quickly open a nearby window, and go outside for fresh air immediately. --When outdoors, wear warm clothing and cover exposed skin. Use multiple layers to maintain warmth. --Seniors should take extra care outdoors to avoid slips and falls from icy conditions. --Check on neighbors, friends, relatives and clients (if you are a service provider). --If you need a prescription filled, do so today before the arrival of the snow and dangerously cold temperatures. --Home visiting and social service agencies should activate their cold emergency plans, and reach out in advance to their clients to make sure they're aware of the cold and snow. --If you are concerned about someone on the street who may be homeless and in need of assistance, call 311 or local authorities and ask for the Mobile Outreach Response Team. The Department of Homeless Services will send an outreach team to the location to assess the individual's condition and take appropriate action. --If your building is cold, check on your neighbors. If you know someone who is vulnerable and lacking heat, help them get to warm places and notify the building manager and/or call 311 or your local utility to get heat restored. If you see someone with signs of hypothermia such as confusion, shivering, slurred speech, drowsiness call 911 for help and help the person get warm while waiting for help. --Landlords and building managers should check their building systems to ensure heat, and check on vulnerable people. --Hypothermia is a life-threatening condition where the body temperature is abnormally low. Symptoms may include shivering, slurred speech, sluggishness, drowsiness, unusual behavior, confusion, dizziness, and shallow breathing. Some people, such as infants, seniors, and those with chronic diseases and substance abuse problems can get sick quicker. Check on friends, relatives, and neighbors who may need assistance to ensure they are adequately protected from the cold. --Frostbite is a serious injury to a body part frozen from exposure to the cold. It most often affects extremities like fingers and toes or exposed areas such as ears or parts of the face. Redness and pain may be the first warning of frostbite. Other symptoms include numbness or skin that appears pale, firm, or waxy. --If you suspect a person is suffering from frostbite or hypothermia, call 911 to get medical help. --While waiting for assistance to arrive, help the person get warm by getting them to a warm place if possible, removing any damp clothing and covering them with warm blankets. --Insulate your home as much as possible. Hang blankets over windows and doorways and stay in a well-insulated room while the heat is out. --Dress warmly. Wear hats, scarves, gloves, and layered clothing. --If you have a well maintained working fireplace and use it for heat and light, but be sure to keep the damper open for ventilation. Never use a fireplace without a screen. --If the cold persists and your heat is not restored call family, neighbors, or friends to see if you can stay with them. --Do not use your oven or fuel-burning space heaters to heat your home. These can release carbon monoxide, a deadly gas that you cannot see or smell. --Open your faucets to a steady drip so pipes do not freeze. --Make sure you have a working smoke alarm in every room. Test them at least once a month and change the batteries twice a year. --Use only portable heating equipment that is approved for indoor use. Space heaters are temporary heating devices and should only be used for a limited time each day. --Keep combustible materials, including furniture, drapes, and carpeting at least three feet away from the heat source. Never drape clothes over a space heater to dry them. --Never leave children alone in the room where a space heater is running. Always keep an eye on heating equipment. Turn it off when you are unable to closely monitor it. --Plug space heaters directly into a wall outlet. Never use an extension cord or power strip. Do not plug anything else into the same outlet when the space heater is in use. Do not use space heaters with frayed or damaged cords. --If you are going to use an electric blanket, only use one that is less than 10 years old from the date of purchase. Also avoid tucking the electric blanket in at the sides of the bed. Only purchase blankets with an automatic safety shut-off. --Carbon monoxide comes from the burning of fuel. Therefore, make sure all fuel-burning devices such as furnaces, boilers, hot water heaters, and clothes dryers are properly vented to the outdoors and operating properly. If you are not sure, contact a professional to inspect and make necessary repairs. --Make sure you have a working carbon monoxide detector. Most homes and residential buildings in New York City are required by law to have carbon monoxide detectors installed near all sleeping areas. Owners are responsible for installing approved carbon monoxide detectors. Occupants are responsible for keeping and maintaining the carbon monoxide detectors in good repair. --If you have a working fireplace keep chimneys clean and clear of debris. --Never heat your home with a gas stove or oven, charcoal barbecue grill, or kerosene, propane, or oil-burning heaters. --The symptoms of carbon monoxide poisoning are non-specific and include headache, nausea, vomiting, dizziness, sleepiness, trouble breathing, and loss of consciousness. Severe poisonings may result in permanent injury or death. The Human Resources Administration (HRA) administers the federal Home Energy Assistance Program (HEAP), which provides low-income people with emergency heating assistance. Eligible residents will receive a payment for fuel delivery, or HRA will arrange for fuel delivery or boiler repair. Emergency assistance is given to those who qualify only once per heating season. Call 311 for more information. The Department of Homeless Services (DHS) continues to use its Cold Weather Emergency Procedure, called Code Blue, to protect unsheltered individuals, who are more at risk for exposure deaths during the cold winter months. --Identify and regularly monitor individuals who may be at risk during cold weather. --Engage at-risk individuals and persuade them to voluntarily come indoors. Safe havens and stabilization beds: Chronically homeless individuals may be transported to these low-threshold housing options where they may go directly from the street to a bed. For more information about cold weather safety and how you can prepare for emergencies call 311 or visit NYC.gov.